The principal suddenly resigned after the school's board accused him of fraud, but the controversy raises questions about the school's links to the Gülen movement. 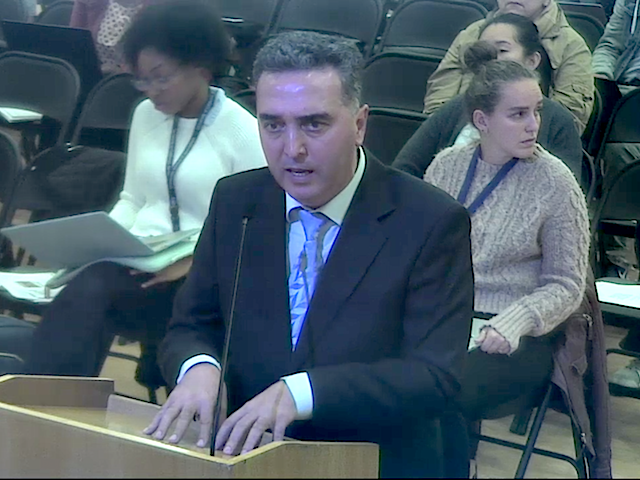 At an OUSD board meeting last November, BayTech Principal Hayri Hatipoglu angrily denounced questions about his school’s ties to the Gulen movement. Just before the end of the last school year, the principal of Oakland's Bay Area Technology School, Hayri Hatipoglu, suddenly resigned. At least four other senior staff and two of the charter school's five board members also abruptly quit. As a result, the organization was thrown into chaos. And then Hatipoglu disappeared. According to several sources, he left the country with his family for Australia, where he is a citizen. Afterwards, the Oakland Unified School District, which is responsible for overseeing the BayTech charter school, opened an investigation. BayTech's three remaining board members also hired an independent party to carry out their own internal review. While OUSD and BayTech have both attempted to keep the mini-crisis under wraps, the Express has learned that BayTech's three remaining board members are accusing Hatipoglu of defrauding the school. They allege that Hatipoglu surreptitiously changed his employment contract to provide himself with three years' worth of severance pay totaling about $450,000, an unusually large sum for a small school with an annual budget of approximately $3 million. His previous contract provided for only six months of severance pay, a standard in the education sector. "We believe he changed his contract," said BayTech board member Fatih Dagdelen in a recent interview. "According to his contract, he'd get paid a six-months salary if he resigned, but all of a sudden his contract said he'd get paid two-and-a-half years further." As to why Hatipoglu resigned, Dagdelen declined to say, but he added, "we have a lot of evidence and believe there's a fraud." Hatipoglu has countered that he did nothing wrong. Instead, he alleges that Dagdelen and two other BayTech board members are part of a "shady network" trying to "take over" the school. In an unusual and unsolicited email to the Express sent on June 28, Hatipoglu wrote that the school's Turkish board members conspired to punish him for his decision to break ties with a Southern California-based nonprofit. The nonprofit, Accord Institute, happens to be controlled by the followers of a powerful Turkish imam who leads a global Islamic political force called the Gülen movement. Founded in the 1970s by the religious leader Fethullah Gülen, the Gülen movement is an Islamic-inspired social and political force that globalized as its followers immigrated to Europe, Australia, and the United States. The Turkish government considers the Gülen movement a terrorist organization because its members helped organize the 2016 coup attempt against President Recep Erdogan, and Erdogan has ordered thousands of Gülenists jailed. (The U.S. government, however, does not classify the Gülen movement as a terrorist organization.) Fethullah Gülen currently lives in self-exile in Pennsylvania, but he's considered one of the most powerful men in Turkish politics. His followers also set up and operate one of the largest chains of charter schools in the U.S. BayTech is one of these schools. Former BayTech staff told the Express that for years there have been questionable financial practices at the school. They also confirmed that leading up to Hatipoglu's departure, there appeared to be a split between the school's Turkish directors and the former principal, but the cause of the falling out wasn't apparent. Non-Turkish staff and board members at the school said they have mostly avoided inquiring into the school's links to the Gülen movement. But over the past decade, OUSD received multiple complaints asking that BayTech's rumored ties to the Gülen movement be closely examined. BayTech's leaders condemned these critics, however, calling any attempts to question the school's ties to Fethalluh Gülen's followers a form of discrimination. At the OUSD board meeting last November, when BayTech was seeking to renew its charter, several members of the public questioned why the school district hasn't investigated. Hatipoglu responded angrily at the meeting by denying any link to the Gülen movement. "It's worrisome for me that politics and education are in the mix here because whatever BayTech does, it goes through district oversight, state oversight," Hatipoglu said. "Is there one concrete example? Show me. It's all about slander." According to Joshua Hendrick, a professor of sociology at Loyola University Maryland, many followers of Fethullah Gülen actually deny being part of the movement. This is especially true of Gülenists who have organized charter schools in the U.S.
OUSD officials have largely ignored BayTech's links to the Gülen movement, and the district had declined to investigate the school. But now, following the departure of the principal and other staff and allegations of fraud, OUSD confirmed that they've opened an investigation. "OUSD takes seriously any allegations of financial mismanagement in our schools," district spokesperson John Sasaki wrote in an email. "As the charter authorizer, we have been informed of allegations of financial impropriety at BayTech." According to BayTech's board meeting minutes from July 20, OUSD sent the charter school a Notice of Concern that outlines potential fiscal and managerial problems at the school. Just eight months prior, OUSD's charter schools oversight office concluded that BayTech was fully in compliance with all fiscal controls. In a memo to OUSD's board, Superintendent Kyla Johnson-Trammel and Silke Bradford, who led OUSD's office of charter schools until February, wrote that allegations made against the school regarding fiscal mismanagement were "completely unfounded." Johnson-Trammel and Bradford also wrote that claims that BayTech is linked to the Gülen movement — which the FBI has investigated for misusing public funds — are false. They concluded that critics of the Gülen movement who pointed out the school's ties were "racist." Following this assessment, OUSD's board renewed BayTech's charter to operate. But BayTech's direct links to the Gülen movement are readily apparent. BayTech, which is run by the nonprofit Willow Education foundation, was founded with a $450,000 state Department of Education grant in 2003 by Suleyman Bahceci, a prominent member of the Gülen movement who has set up other charter schools in Texas, Utah, and Southern California. Bahceci didn't respond to an email seeking comment for this report. Robert Amsterdam, an attorney working on behalf of the Turkish government, has identified Bahceci as one of the Gülen movement's key organizers in the U.S. charter school industry. "Charter schools are free money for them," said Sharon Higgins, an Oakland resident who has closely followed the Gülen movement's expansion into the U.S. education sector. "If they get a school opened, they can bring their members to the U.S. They have a lot of H-1B visas to get their members here, so it's a way to increase their membership in the U.S. and tap into public funds." Willow Education has obtained numerous H-1B visas to hire teachers from Turkey and other countries where the Gülen movement is strong. According to U.S. Department of Labor records, since 2009, Willow Education used 29 separate visas to hire math, science, English, and Turkish language instructors. One of these visas was assigned to Hatipoglu. He immigrated to the U.S. from Australia, although he is of Turkish origin. Former BayTech staff told the Express that Hatipoglu took over BayTech at a time when the school was struggling financially and that he was able to turn it around. Parents and teachers at the school told the Express that the school has excelled academically, even if BayTech has run into management and financial problems. In addition to Bahceci, other past BayTech staff and board members have obvious ties to the Gülen movement, according to records and interviews. One key link is through the Accord Institute, a nonprofit charter school management company that was established by Bahceci and other Gülen movement members. In Los Angeles, the Gülen movement set up several charter schools called the Magnolia Science Academy. These schools were audited in 2014 and 2015 by the Los Angeles Unified School District's Inspector General and the California State Auditor. Both series of audits found numerous problems including weak financial controls, bad record keeping, and mismanagement. The Magnolia schools were found to be paying Accord hundreds of thousands of dollars a year for services, but it's unclear what Accord did with the money. In addition, Bahceci ran Magnolia schools when the lucrative contracts with Accord were signed, and then he later moved back to Accord. Auditors ultimately found nothing illegal in the dealings, however. Baris Cagdaser helped found Willow Education and BayTech alongside Bahceci and served on BayTech's board until 2012. Cagdaser was also on the Accord board of directors with Bahceci. And Accord's current CEO, Matt Avsaroglu, was a cofounder of BayTech and worked there until 2009. Like the Magnolia schools in Los Angeles, BayTech also had a relationship with Accord, although it's unclear how much BayTech was paying them. BayTech hasn't posted financial information about its dealings with Accord on the school's website. Additionally, BayTech is missing copies of its board meeting agendas and minutes from years prior to 2009, and hasn't posted minutes for any other board meetings held prior to August of last year. Hatipoglu alleges that he's a victim of retaliation by BayTech's three Turkish board members because he tried to cut ties with Accord. In his email to the Express, Hatipoglu wrote that last year he moved to have Accord's contract terminated due to the controversy around its dealings with the Los Angeles Magnolia schools. But according to Hatipoglu, Accord's CEO responded by retaliating. "He indicated to me that I made a huge mistake and that I would pay." Several calls to Accord went unreturned. At BayTech's board meeting on Monday, two of the school's three remaining directors, Dagdelen and Volkan Ulukoylu, declined to say whether the school is linked in any way to the Gülen movement. In response to Hatipoglu's allegations about a "shady network" trying to control the school, Ulukoylu said he had "no idea" what the former principal was talking about. Dagdelen said he couldn't comment further about Hatipoglu's alleged fraud, but he added that just three days after BayTech opened its investigation, Hatipoglu appeared to have left the country.